Are you looking for highly professional hotel, restaurant, motel or resort management power point presentations? Then you have just come in the right place. Hospitality School, one of the most popular free hotel & restaurant management training blog is offering various power point presentations on different topics related to hotel, resort, motel i.e. 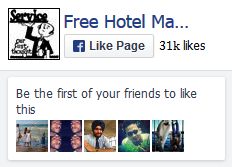 hospitality industry. So far our team has prepared following power point presentations packages that you can buy. You will get 225 Food & Beverage (F & B) Service Power Point Presentations collections. These 225 power points are F & B Standard Operating Procedures (SOP). Highly recommended for F & B professionals like waiter, food servers, F & B Manager, F & B Directors etc. and hotel management students. You will get power point version of our F & B Service Training Manual. This is an amazing 231 Hotel Power Point Presentations collections. If you are looking for Hotel Front Office Standard Operating Procedures then this is must for you. This is power point presentation version of our Hotel Front Office Training Manual. 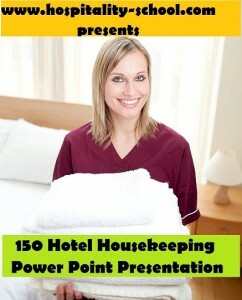 There are 150 Hotel Housekeeping Power Point Presentations collections. All the power points are housekeeping Standard Operating Procedures (SOP). Exact power point presentation of our Housekeeping Training Manual.